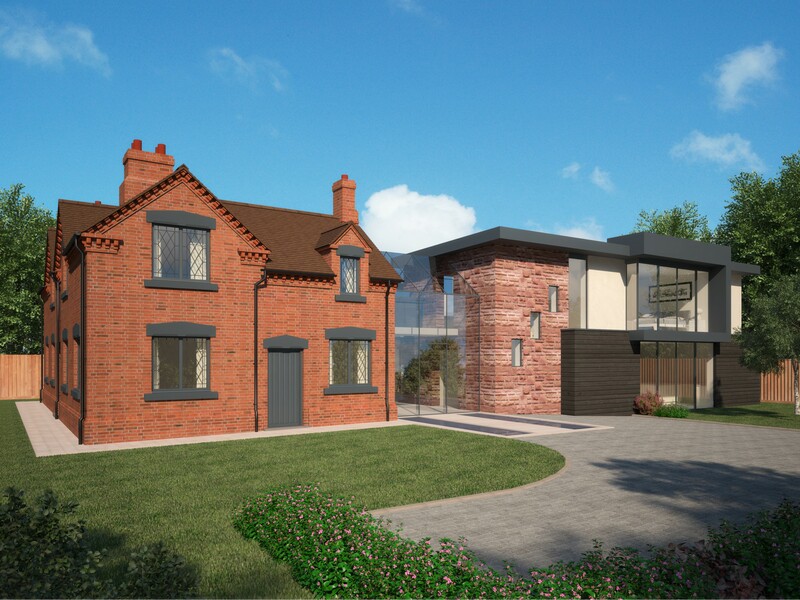 As we progress with working and detailed specifications, we would like to provide you with further information on our project in Acton Trussell. 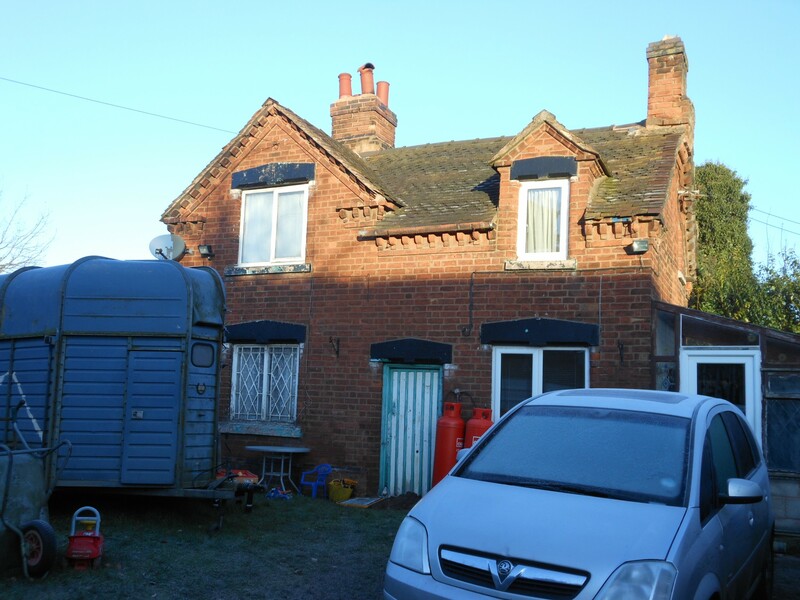 Below we have taken information from our original brief and planning documentation to provide an overview of the refurbishing of Bank Cottage. Refurbishing the locally listed Bank Cottage, where modern contemporary design is fused with a traditional time served building of the past to provide a dwelling that meets the demands of modern family living. The three Bank Cottages were built between 1851 – 1884 and were part of the Anson Estate. The Anson estate was, up until recently, owned by Lord Lichfield who resided at Shugborough Hall. One of the three cottages remained inhabited until September 2015. Currently there is no formal sanitation within the cottages. Its occupants used the original ‘outhouse’ which remains almost completely untouched from its original form in the rear garden. A heritage assessment was commissioned and formed an important part of the planning documentation. 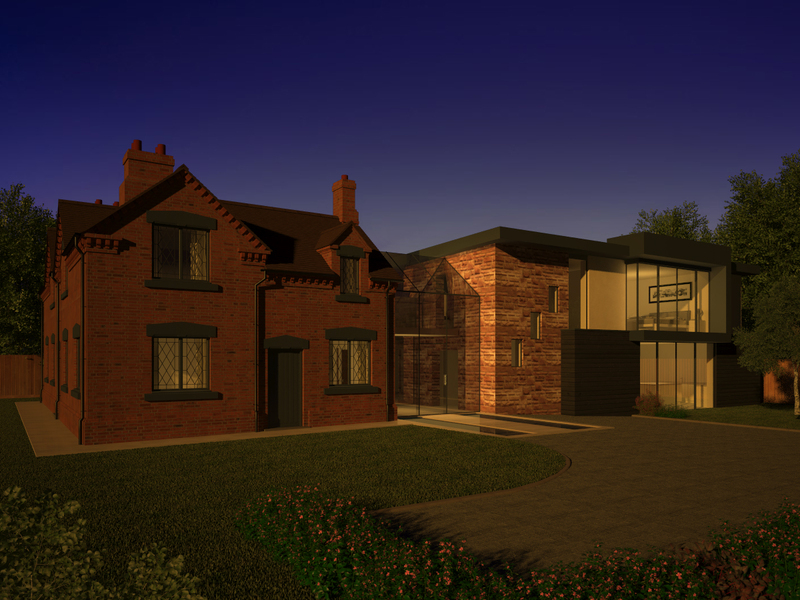 The heritage assessment gave a detailed history of Bank Cottage and greatly informed the design of the contemporary extension. 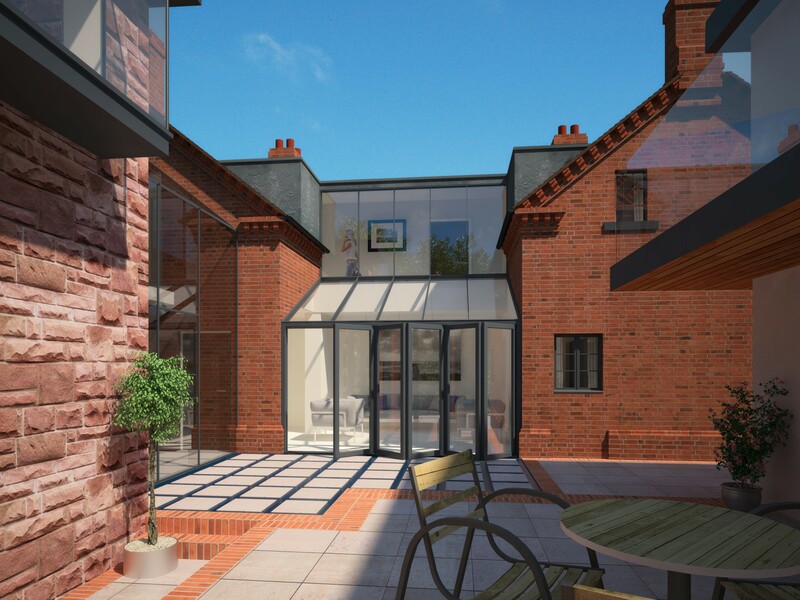 To renovate and convert three existing cottages into one dwelling, achieved with a large contemporary extension to the rear helping to form an inner courtyard. 1. 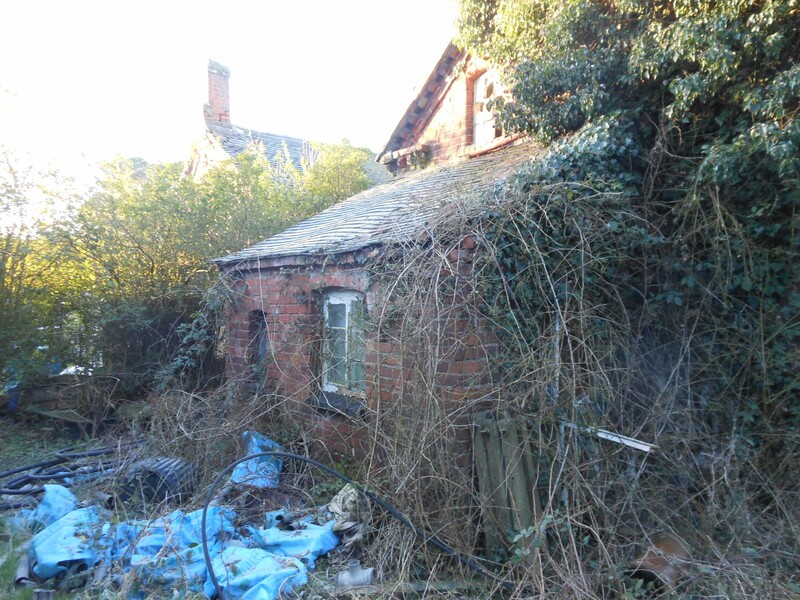 Demolish existing out buildings shown on the existing plans and topographical survey. Reclaim materials for later use. 2. 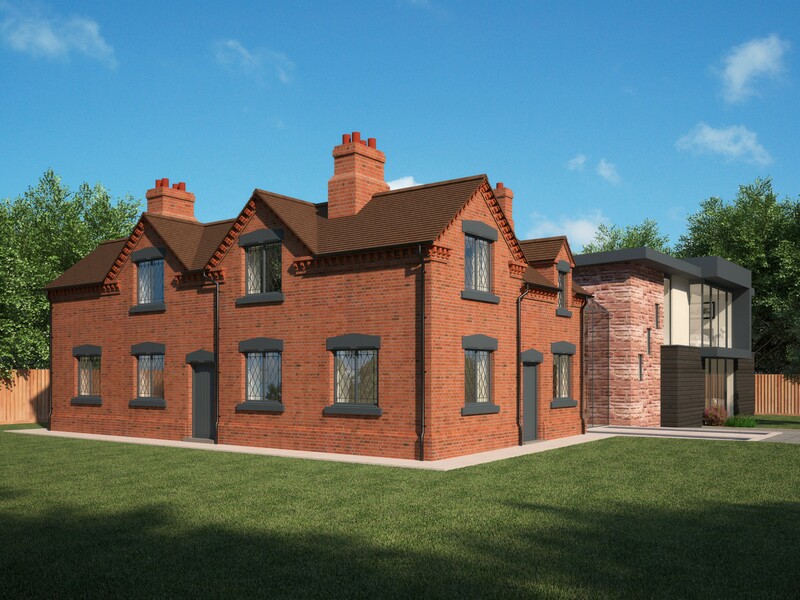 Renovate and convert the existing three cottages into one dwelling using the reclaimed materials where possible. 3. Construct a new independent contemporary extension to the rear. 4. Construct a glazed link incorporating a bridge and corridor to link between the new and existing. 1. Car Parking Width, wider parking space to enable easy access to and from a vehicle. 2. Access from Parking Space, vehicle parking space close to home entrance. 3. Approach Gradients: Level or gently sloping without the need for stepped approach. 4. Entrances: Level thresholds for wheelchairs, buggies etc. 5. Doorways and Hallways: Approach to doors by wheelchairs, head on or from the side. 6. Wheelchair Accessibility: Space for wheelchair turning. 7. Living Room: Entrance level living space. 8. Entrance Level Bed Space: provision of temporary bed space at entrance floor level. 10. Bathroom & WC walls: Walls are strong enough to support future grab rails and other adaptations. 11. Stair Lift / Through Floor Lift: adaptations for access to first floor for all users. 12. Tracking Hoist Route: Structure suitable for installation of tracking hoist from bedroom to bathroom. 13. Bathroom Layout: Space in front of or to side of WC facilities. 14. Window Specification: Window and handle positions at suitable heights, low cills to living room windows. 15. Controls, Fixtures & Fittings: Sockets, switches and controls at low height to suit all users. 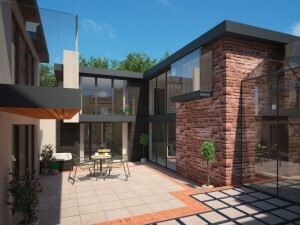 The new extension will utilise elements that offer a high thermal mass. The ground floor construction for example will be constructed with insulation to the underside of a polished concrete slab. Under floor heating will be integrated within the floor slab itself. Walls will be insulated externally and will be constructed in dense block with plaster a finish internally. Both the concrete floor and dense walls will collect energy from the natural sunlight, encouraged by passive solar design principles, and also from heat from general zone controlled heating. The orientation of the existing 3 cottages enabled the new extension to be designed with a approximate north – south orientation to incorporate passive solar design principles. The new dining area and kitchen areas are largely glass, oriented south. The orientation is such that during the summer months, where the sun is at its highest, the wide overhanging eaves to the 1st floor balcony provide good levels of shading to the glazed areas, therefore reduce the risk of over heating. During the winter months when the sun is at its lowest, the large full height glazing will be in direct sun light, enabling it to penetrate into the rooms and heat up the concrete floor. This stored energy in the form of thermal mass will help reduce the load on the boiler and maintain a constant temperature. 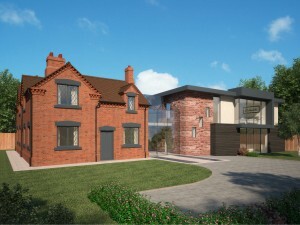 The new extension will make the best use of modern methods of construction, enabling the building to achieve a high level of thermal performance. Ground floors, external walls, roofs and windows will return on average the equivalent of a code level 6 dwelling. We are currently investigating into the use of mechanical ventilation and heat recovery as a supplemental aid to efficiency. Heating and hot water, to both the existing and extended area, will be provided by a low carbon bio-mass boiler. The boiler will be located within a detached garage on the site. The water heated by the boiler will be piped into the dwelling, stored where necessary, and pumped on demand, for showering as an example. 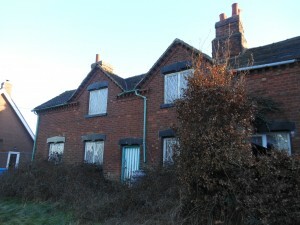 Bank Cottages as a whole will be generally retained and refurbished to bring it into the 21st century. We adopted a sympathetic design approach to the buildings conservation and restoration, therefore will use locally sourced and crafted materials where possible. 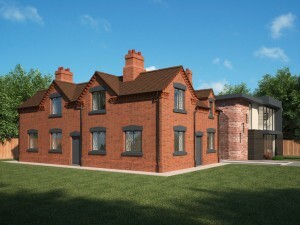 To preserve and enhance the existing bank cottages, existing brickwork will be re-pointed with lime mortar, and repaired with reclaimed bricks taken from the demolition of the existing dilapidated outhouses. Stone work will be repaired and repainted in-situ and only replaced if absolutely necessary. Internally existing external walls will be dry-lined with breathable natural fibre Thermafleece insulation. New ground floor slabs will be a breathable Sublime insulated limecrete floor with under floor heating. The use of this flooring system will provide a naturally insulating floor, but more importantly will remain breathable. The existing roof is in such a bad state of repair that it will be removed completely and receive a new structure, membrane and tiling reclaimed from the original roof. Windows and doors will be replaced with hardwood incorporating double glazed units. The windows will be individually detailed and crafted to match the existing. We have adopted a system of detailing windows which has been approved on many listed buildings, by many different authorities to incorporate double glazing.